You might recall my collaboration with Sparrows Nest back in 2017- I painted a Prodigal Son mural series in collaboration with Reverend Jamie Scott, the brilliant and admirable Executive Director of Sparrows Nest. So when Rev. Jamie invited me back to live paint their Spring Banquet on February 21, I was more than thrilled! The challenge that came with painting this event was the time limit: I had 1.5 hours to paint a few studies and an 18x24 in canvas that would go up for auction right away. As far as I know, most event artists will do a little painting at the event and finish it up later, just as long as they have something nice for the guests to look at. Not this time! This time I was under a lot of pressure to make something great FAST, and it was so exciting. No time to think, only time to paint! And if you ask me, I pulled it off. 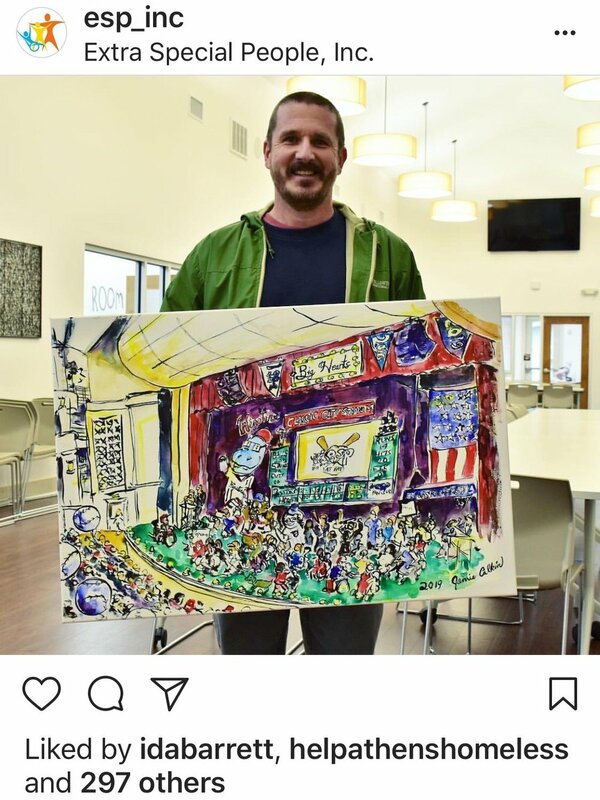 Any guesses on how much the painting sold for? My wife Katie was shocked when I told her how much it went for. Drum roll please…. $4,500! I will admit, I did clean it up a little bit at home after Katie’s reaction… Feels like cheating, but we both feel a lot better about it now! Sparrows Nest plans on making some prints out of it, so if you got out-bid, keep an eye out for those! If you’re not familiar with Sparrows Nest, you gotta know about the wonderful light that Rev. Jamie is bringing to Athens. What’s amazing is he’s bringing God’s kingdom to a place that poverty strikes. I saw it over and over again while doing the Prodigal Son series and I felt that way again after this event- he’s living it so well. It really is an honor to get to work with him and Sparrows Nest. As for the event itself, the host of The Jules Show on JOY FM, Julianna Smoak, emceed and the great DJ Shockley was a guest speaker. It took place at the Athens Cotton Press, which is a really cool building I had never visited before. I loved all of the artists’ graffiti on the walls. I was also really impressed with the people I met that night, especially the Sparrows Nest board members. What a group! What an event! Endless thanks to Sparrows Nest for having me and supporting Athens in a beautiful and necessary way. The art donations didn’t stop there last month! I also attended, painted, and auctioned off a piece for ESP’s Big Hearts Pageant! ESP is a special organization in Athens that I will support endlessly. This is my second year in a row painting this pageant, and I hope I get to continue this growing tradition next year! This year, I sat in a very different spot up on the balcony and got a new perspective. It’s always a fun challenge to paint a similar subject form a different angle! In true ESP nature, something kind and special happened at the auction- The woman who bought the painting, Laura Whittaker, gave it back to ESP to keep! I love when people do that. A great gesture of love and generosity. Wouldn’t expect anything less from the folks at ESP! If you have an event you’d like me to paint, please check out my Live Event Art page! Two weren’t enough! They asked me back to do a few more, and I was more than excited to say yes. This second round of murals was particularly special for two reasons. One, it honors the hospital’s centennial anniversary… 1919-2019, wow! This hospital is such a massive part of Athens history, so it’s an incredible honor to hang my work on their walls, especially at this scale! Second, the new murals are dedicated to Larry Webb, the former Athens Regional CFO, who passed unexpectedly in 2017. You can read more about Larry Webb here, but he sure was a special man to many, including the staff of this wonderful hospital. Every car in the Arch panel is a red mustang. Why? They were Larry Webb’s favorite! Also in the Athfest panel, I did my own rendition of the David Hale mural by Rook & Pawn. A mural within a mural! There’s a little model train set at the bottom of the Athfest panel… Larry Webb famously had a model train set in his basement that he loved very much! The UGA Sports collage is a special dedication to Larry Webb’s passion for UGA Sports. That man was one committed dawg fan! Take a look at some process pics of the below! I’ve gotta say, as proud as I am of this new milestone project, I’m particularly proud of the Athfest and the UGA Sports collages. I love doing a classic paint-it-like-you-see-it scene, but collages are a special challenge. To warp reality and create something new out of things people already love is a difficult feat! And I like the ones I made. So I’m extra excited for them to live at Piedmont Athens Regional, a place that’s very important to my family and families across Athens. If the Athfest or Arch panels interest you, take a look below! If you keep up with Jamie at all, you probably already know he never stops painting. One look at his studio tells that story; his display of hard work is practically spilling over with paintings small and large, line-sketched and colored, on canvas and on paper. His giant body of work might suggest all work and no play, but even the master of bright, playful paintings has to play sometimes. And by play, I mean take a vacation. However, since Jamie’s passion became his job, I would argue his vacations don’t quite match most definitions of a vacation. Of course he does normal vacation things like relaxing and spending quality time with family and friends. But from what I’ve seen and heard of Jamie’s vacations, he always has his art satchel in tow. Inside his weathered and paint-stained satchel, he keeps a water bottle, Holbein paints, Bombay black ink, brushes, nibs, and various cuts of his favorite Fabriano water color paper. No matter where he travels, Jamie is always at-the-ready to sit down against a tree or a building and document whatever new scene strikes him as interesting. It’s my understanding that Jamie loves to paint “en plain air” (outdoors), so really, it makes sense that he spends his down time painting different locales. So picture the perfect Jamie Calkin vacation. Idyllic beaches? Fantastic mountains? A colorful new city? All scenes worthy of Jamie’s bouncy, loose style, for sure. But his most recent vacation wasn’t any of the usual scenes. This vacation promised more… challenge. Jamie and I had a lengthy conversation about how cruise ships are generally a weird experience for all of the obvious reasons. A bunch of strangers trapped on a boat together with nothing to do but eat, drink, swim, and get sunburned. The list goes on and on. 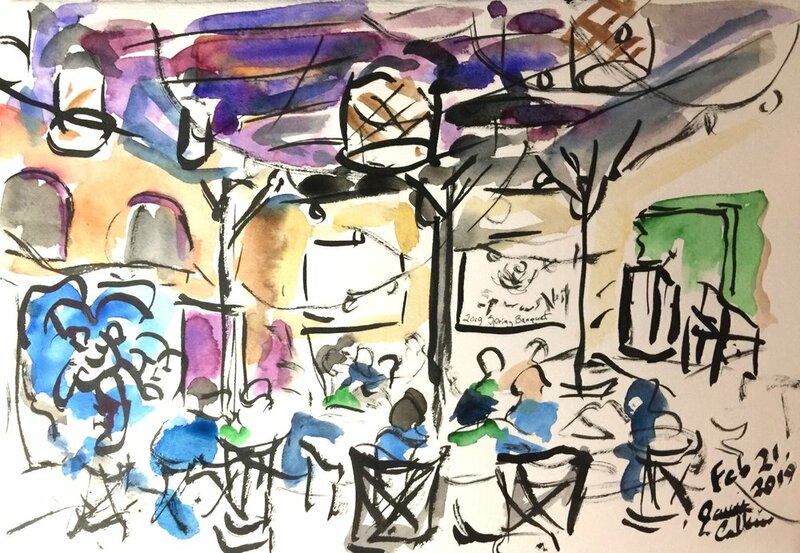 Despite all of the weird-ness, Jamie found that the pool/ dance floor/ bar area was a great spot for people watching and painting. Arguably the best part of cruises are the excursions. The big boat took a stop in Nassau in the Bahamas and gave Jamie these scenes to paint! Despite all of the weird parts of cruises, Jamie said it was overall a great experience, mainly because he was able to spend time with his good friend, John, who was in desperate need of a vacation. Diagnosed with autism at a young age, John comes from a tough background and works extremely hard day-to-day. Needless to say, Jamie was overjoyed to share such a purely fun experience with a dear friend who deserved it! Another great part of the cruise was meeting some new friends, an incredible couple that joined Jamie and John for dinner one night. After some great conversation, they all spent a day together in Jacksonville. If any of the above paintings tickle your fancy, take a look at some originals for sale below! This year, I had the honor to parter with the AU/ UGA Medical Partnership and create two 4 feet by 8 feet paintings of UGA's Health Sciences campus. What a project! I love painting at this scale, especially when I get to include my friends and family in the process. The first painting, the one shown in the above video, is of UGA's Winnie Davis Hall. I had tons of help from my wonderful spring interns, Arezou Taeed and Amy Scott, as well as from James Lineburger and my daughter, Ruby Calkin along with Bill Prigge, UGA's Campus Director for Finance and Operations. I'm so honored to be a part of this great community of students and staff alike. The above slideshow documents my painting process via the @jamiecalkinart Instagram story! I had a lot of fun with the second painting, too, though this one was more of a solo effort (emotional support provided by Snowflake the Dog). Initially, I was instructed to paint the Health Sciences Campus Russell Hall... but they gave me the creative freedom to take it elsewhere. Naturally, I made it a little harder for myself :) Instead of a ground-view panorama style similar to the Winnie Davis painting, I decided to try a bird's eye, drone perspective. Which, as much as I loved the idea, proved to be aesthetically challenging! I thought of this painting almost as a map, but challenged myself to not just show the buildings and locations as a map might. I wanted to create the whole scene with character! I had some fun with the details (see the unicyclist on Prince Ave??) It was a fascinating experience. A BIG thank you to Bill Prigge and Dean Shelley- I loved working with both of you so much! It's been an honor. Click here to see the print of the first painting of Winnie Davis Hall! The past year has been a whirlwind for Jamie Calkin Art! As the summer festival season slowed down and Athfest approached in late June, I looked forward to catching up with all of the Athens locals who grace my booth! Many of these people I only see once a year, so I knew they'd ask what I've been up to since last Athfest. I also knew I wouldn't be able to think of a great answer to that question on the spot. As a solution to my scattered brain, I present to you the 2017-2018 Jamie Calkin Art Infographic! Thanks to Rachel Owart for this great graphic! Every year, multiple educators of the arts in Athens-Clarke County are awarded the AthFest Educates Grant to channel a child's voice through a form of art. One of the 2018 grant winners was Dan Smith, Barnett Shoals Elementary art teacher. He teamed up with successful Athens artist and BSES parent Jamie Calkin to create a project for 5th graders that would celebrate the graduates time in elementary school. Jamie Calkin has worked with Dan Smith and former BSES art teacher Leonard Piha many times before. As his now-high school daughter, I can attest to this. I, as well as my now-middle school sister have endured the embarrassment of my father presenting his ecstatic and coffee induced excitement to my class of judgmental students. Not to say his work at my former elementary school has not being meaningful. Contrary to my experience, my classmates absolutely loved having created a masterpiece with a seasoned artist. Now, 4 years and a grant later, Calkin, Smith, and BSES 5th graders have created 3 (one for each class) legacy projects representing their experiences grades kindergarten through 5th. Jamie used professional supplies to make murals with the newest Barnett Shoals, the old Gaines school (that the students spent majority of their elementary school years in), and the current cafeteria as the background to the students more important (no offense Dad!) role in this project. Needing to portray the kids as not only students but as artists, Jamie and the kids starting experimenting. The end result was to incorporate their favorite picture they had recently drawn into the murals. No theme, just a simple representation of themselves. Jamie drew the kids on their classes respectable murals holding the picture they created. As for the students experience working with Jamie, it was “stimulating” and “expressive” according to participants Ruby Calkin (aka my sister and Jamie’s daughter) and her friend Eva Lucero. “Mr. Jamie and Mr. Smith did not force us to do what they thought would look good, instead they let us choose to do what we thought expressed ourselves.” says Eva. “I liked that my dad taught us something original and didn’t get ticked off if we messed up.” added Ruby. Jamie described collaborating with Dan saying “it is so easy to work with Dan because he is so go with the flow.” According to Jamie, merging his work with the students was, per usual, a “challenging but in the end, a rewarding experience”. Ruby Calkin, holding the portrait she drew of her friend Lorelei. None of this could have been possible without the AthFest Educates Grant, which Dan and Jamie are very grateful of. AthFest is an annual festival of art and music located in downtown Athens every June. Jamie has been a part of AthFest longer than any other artist in Athens, participating since 2001. I have many memories visiting his booth and buying gifts for my mom’s upcoming birthday, which is part of the reason why it’s a favorite event of the Calkin family. The other reason is because of the work AthFest does behind the scenes. The nonprofit event uses it’s earned money to spread the joy art brings around Athens-Clarke County. The AthFest Educates Grant is part of this mission, and Jamie and Dan’s too, which is why they were so thrilled to receive it. Thanks to the AthFest Educates Grant, Jamie Calkin, and Dan Smith, a piece of the BSES class of 2018 will hang on the walls of the school that they grew up in for years to come! Extra Special People is known for the love and encouragement they pour into their community. For Jamie, being able to witness that love has been an incredible experience. Jamie has become part of the ESP community through his work as an artist. He painted a mural outside of their community center in Watkinsville and live painted the Big Hearts Pageant in February. While doing art for ESP, Jamie said he has been particularly touched by the passion and dedication the leaders of the community have to loving their children. Throughout the pageant, people of all ages performed their talent for a supportive audience that sold out the Classic Center in Athens. Jamie said he believes God working in the ESP community. The Big Hearts Pageant created a kind of energy that moved through the crowd and took the audience through many emotions. Several times, the hosts talked about tears and the overwhelming emotion that comes with witnessing such a wholesome event. As one of Jamie’s interns, I was able to witness just how incredible the ESP community is. I received a warm welcome at the pageant, and the same level of enthusiasm and encouragement from guests that Jamie did. The support the ESP community has for each other touched Jamie. He said the excitement everyone has for what he’s doing seems to make the stress of his job go away. The Sparrow’s Nest has been an Athens staple since the early 1990’s. It began as an outreach ministry of Christian Life Church, but today is an independent ministry working with several local churches. Jamie Calkin has been an active member of the Athens community for years. Through his work, he captures the vibrant and unique atmosphere that Athens has to offer. It made sense that Jamie would be involved with the community at the Sparrow’s Nest as well. Jamie was familiar with the work that the Sparrow’s Nest does in the community and felt the need to contribute. He says the whole thing started with him thinking about ‘What do I do best?’. Thus, the Sparrow’s Nest mural project was born. The mural project started in the spring of 2016 with the help of Reverend Jamie Scott. The six-part mural depicts the story of the prodigal son and his journey from receiving his inheritance, to blowing it all, and then to being accepted back by his family. 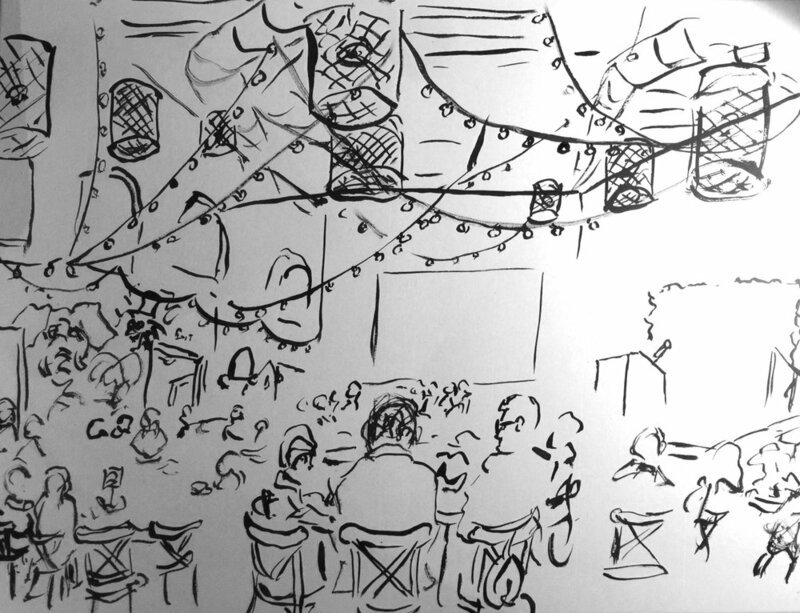 Like most of Jamie’s work, he started by sketching some studies of what each panel will look like. The entire project took about a year. Throughout the duration of the project, Jamie would spend about two hours at the Sparrow’s Nest every other week. There were points where the project got off track, but Reverend Jamie was there to bring it back to center. Jamie says that without him, the project could’ve taken much longer than year. Jamie incorporated himself and Reverend Jamie into the murals by using them as inspiration for the figures depicted. He used Rev. Jamie to model the prodigal son because he felt he identified with the story, and used himself to depict the brother. Reverend Jamie says that he loves the part of the story where the prodigal son is welcomed home by loving grace. It’s a perfect depiction of how God is all about love and acceptance. All six parts of the mural are currently installed in the Sparrow’s Nest. Jamie believes this project to be “One of the best series I’ve ever done in terms of trying to tell a story through my art”. He also feels that this experience has taught him lessons and helped him to grow spiritually. The vibrant colors catch the corner of your eye as you walk past the 64-foot long mural, but your mind is elsewhere as you pick up the pace to make it to class. You've sat on the cushioned seats across from the mural, but you've been busy with school work and thinking of your next meal. The weekend rolls around, and you have the chance to spend time with friends at an outdoor festival. Into the booth you walk with a curious smile and ask, "are you the guy that painted the mural?" Every 20-something-year-old knows the mural, but who is the person behind the animated and lively artwork? Jamie Calkin is a well-known Athens artist and has slowly been branching out into other parts of the country. He has painted a plethora of other cities, landmarks and college towns. Recently, he has been venturing out into the Atlanta area. He has had coffee shop shows and participates in outdoor shows. Just last weekend, he attended the Virginia-Highland Summerfest. Check out a Q. and A. below on his thoughts from the festival. Q. What about the Virginia-Highland Summerfest appeals to you? Q. What have you learned from outdoor shows? A. I think the displays of my commissioned artwork and event art has really helped generate interest because they're some of the most special things I do. Q. What's an ongoing lesson for you? A. I think my booth arrangement and what makes the booth walls eye-catching is still an exciting challenge for me. It's also a challenge to keep a positive attitude in the face of bad weather, and the added pressure I give myself with high expectations. Q. What's something you've learned that others can take away? A. Know your strengths and weaknesses and be accepting of them. There's a certain audience for every artist and knowing yours is key. Virginia-Highland summerfest is a perfect example of 'be smart about who you listen to.' I've had great, positive people enter my booth and some not so positive. Keep yourself upbeat! Now that time has slowed with longer days and the summertime here, I can take a small breather. This past year has been a big one for me. I've hired a manager, revamped my website, had a number of local shows and worked on large projects around town. It has been a lot to take on, but its been great every step of the way. As an artist, it can be easy to stay behind a facade and allow the artwork to speak for me. So, with this blog, I hope to become more of an open book with all of you. Welcome to the new and improved JamieCalkin.com. I'm pleased with the new look and feel of the site and hope you find it equally easy to navigate. I'd enjoy your feedback on how everything looks. Please feel free to contact me any time.